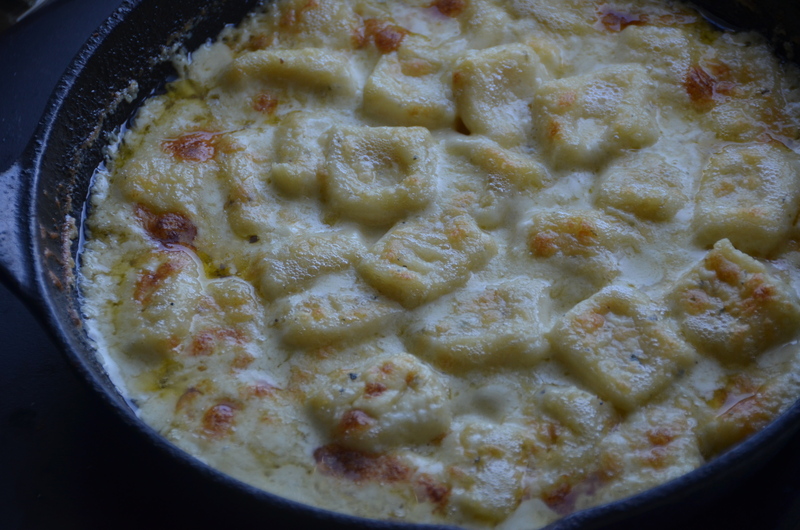 After having gnocchi with gorgonzola sauce in Florence, I knew I wanted to re create it at some point. 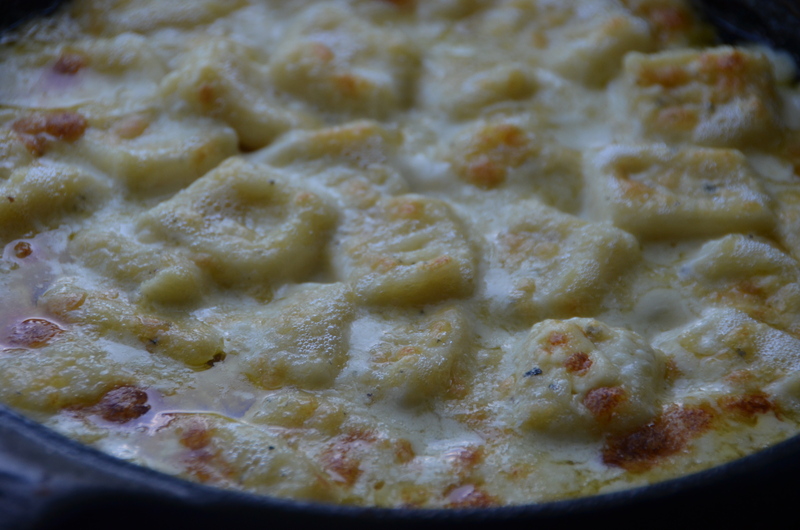 This gnocchi is baked in a creamy blue cheese sauce that is the perfect comfort food. I used a smoked blue cheese, but you can use any type of blue cheese you like. 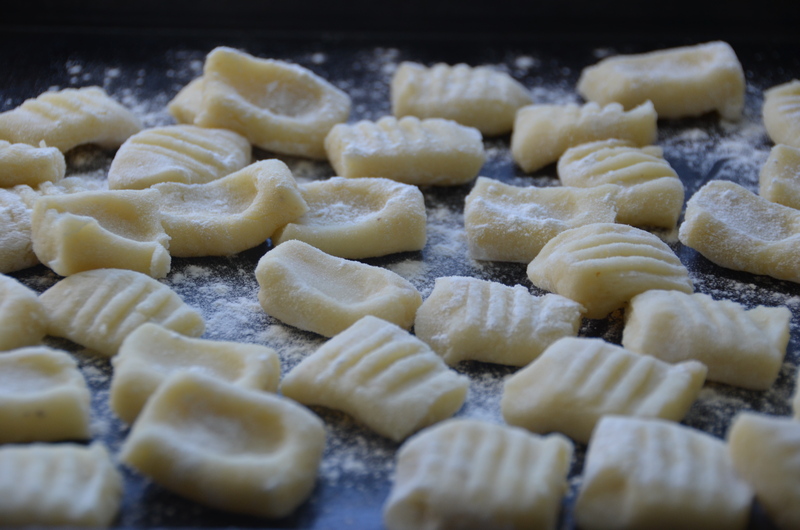 Making the gnocchi takes a little extra time, but store bought gnocchi can definitely be substituted. This dish is great for the upcoming chilly nights as a main dish but would also be a great side for steak or chicken. Bake potatoes in a 425º oven for an hour or until tender. Carefully peel potatoes while hot and pass thru a potato ricer. If you don’t have a ricer like me, just add pieces of potato to a metal sieve and use the back of a wooden spoon to squeeze out potato. Once all your potatoes are riced, spread out and let cool slightly to room temperature. 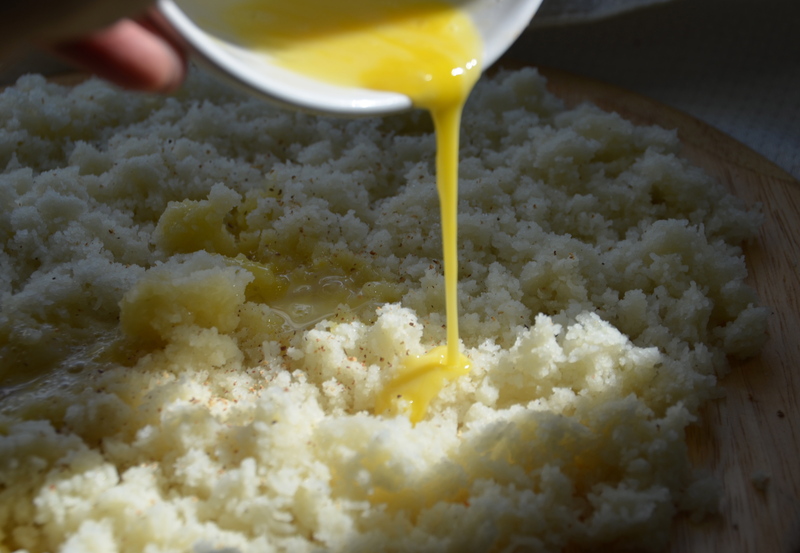 Once cool, beat egg and pour over potatoes along with a few hits of fresh nutmeg and salt. Sprinkle with about half the flour and gently begin to fold ingredients to create a dough. If mixture is too sticky add more flour. I ended up using a little less than a cup. Once dough comes together, it should not stick to your hands and feel very soft and light. Shape dough into a large log about 8 inches long. From that cut 6 equal pieces. 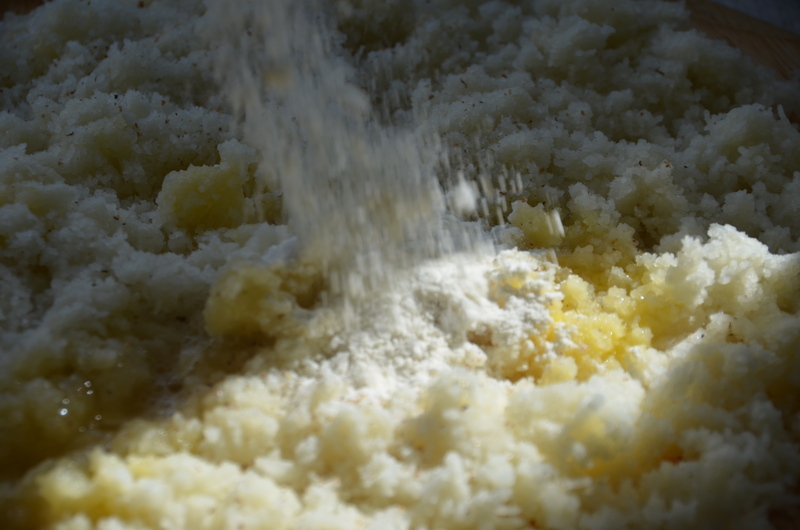 Adding flour when needed to prevent sticking. 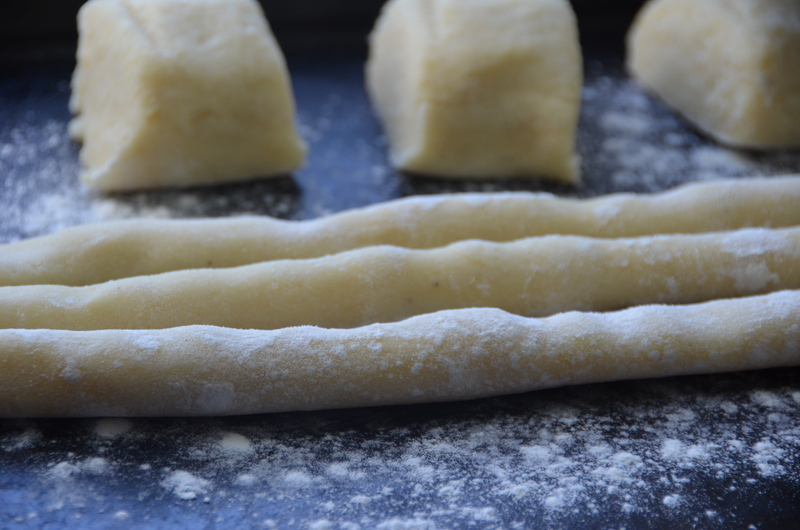 Roll each small piece of dough into a long log shape. Once all pieces are rolled out, take three at a time and cut into small square pieces. My gnocchi were about ½ inch when cut then became a litter larger once rolled on the fork. Once your gnocchi are cut, press against the back of a fork and press down to leave a little indentation from your thumb. This part is not necessary, but it will hold the sauce nicely. Boil gnocchi in a pot of salted water. When they begin to float to the top, remove with a slotted spoon and transfer to your baking dish(I used a cast iron skillet). Melt butter in a saucepan on low heat and add flour, whisk until smooth. Cook butter and flour mixture about 3 minutes whisking constantly to prevent sticking. 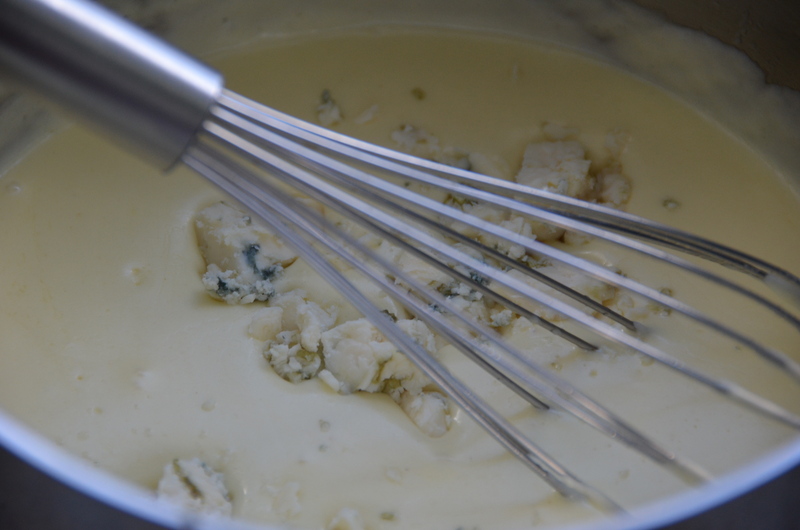 Add warm heavy creamy and continue to whisk. Heat mixture 5 minutes until it has thickened. Remove from heat and add blue cheese. Season with salt and pepper. 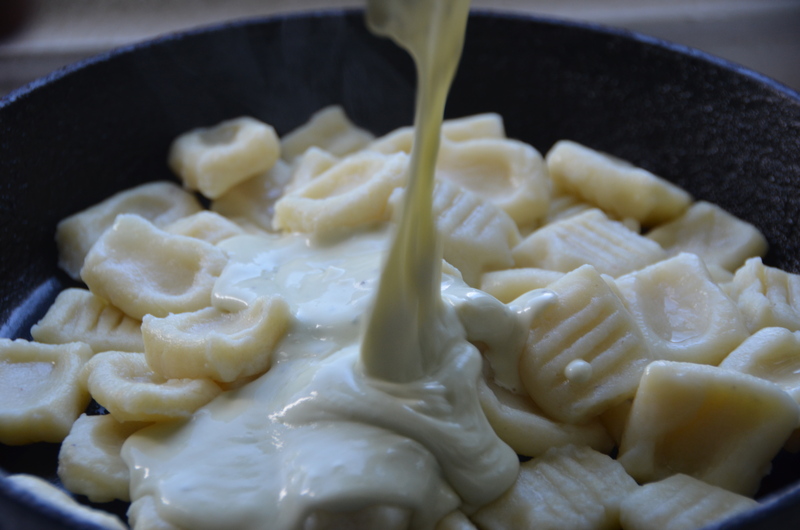 To assemble, pour cheese sauce over gnocchi and gently toss in sauce. Bake at 375º for 25-30 minutes until golden and bubbly. Serve immediately. Try with crumbled bacon or toasted bread crumbs on top. Enjoy! Wow!! This looks so delicious. I have never made gnocchi but always wanted to try. OMG – grab a spoon and dig in – YUM! i agree! this looks so good, and you make it look so easy!